Choose the situation that applies to you and follow the steps in the procedure to connect to your data source. 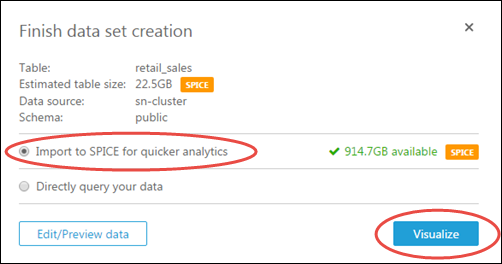 If your Amazon QuickSight account has any autodiscovered AWS data sources, icons for those data sources appear on your start page. If you have credentials for one of these AWS data sources, use the following procedure. 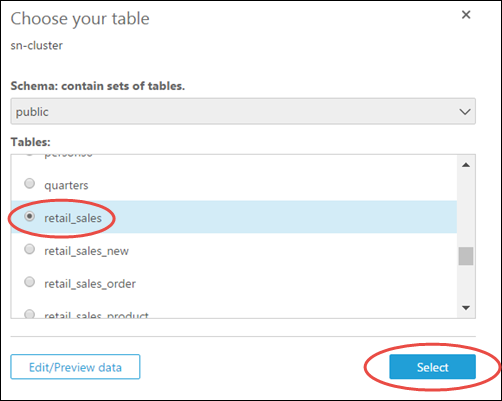 Otherwise, use the procedure in Your Amazon QuickSight Account Does Not Have Autodiscovered AWS Data Sources. Check Data Source Limits to make sure your target table or query doesn't exceed data source limits. Confirm that the database credentials you plan to use have appropriate permissions as described in Required Permissions for Database Credentials. Make sure you have configured the cluster or instance for Amazon QuickSight access by following the instructions in Network and Database Configuration Requirements. 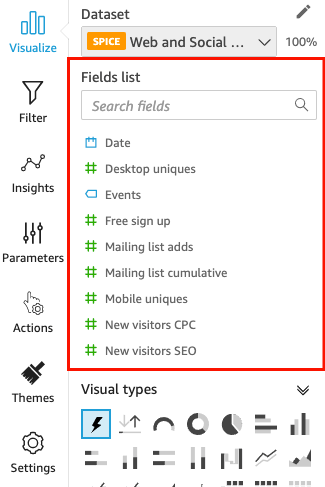 In the FROM NEW DATA SOURCES section of the Create a Data Set page, choose either the RDS or the Redshift Auto-discovered icon, depending on the AWS service you want to connect to. For Instance ID, choose the name of the instance or cluster you want to connect to. Database name shows the default database for the Instance ID cluster or instance. If you want to use a different database on that cluster or instance, type its name. For Username, type the user name of an account that has permissions to access the target database, and also to read (perform a SELECT statement on) any tables in that database that you want to use. For Password, type the password associated with the user account you entered. (Optional) Choose Validate connection to verify your connection information is correct. Amazon QuickSight automatically secures connections to Amazon RDS instances and Amazon Redshift clusters by using Secure Sockets Layer (SSL). You don't need to do anything to enable this. Go to Step 2: Create a Database Data Set and an Analysis. In the FROM NEW DATA SOURCES section of the Create a Data Set page, choose the Redshift Manual connect icon if you want to connect to an Amazon Redshift cluster in another region or associated with a different AWS account, or choose the appropriate database management system icon to connect to an instance of Amazon Aurora, MariaDB, Microsoft SQL Server, MySQL, or PostgreSQL. For an Amazon Redshift cluster or Amazon RDS instance, type the endpoint of the cluster or instance without the port number. For example, if the endpoint value is clustername.1234abcd.us-west-2.redshift.amazonaws.com:1234, then type clustername.1234abcd.us-west-2.redshift.amazonaws.com. You can get the endpoint value from the Endpoint field on the cluster or instance detail page in the AWS console. For an Amazon EC2 instance of MariaDB, Microsoft SQL Server, MySQL, or PostgreSQL, type the public DNS. You can get the public DNS value from the Public DNS field on the instance detail pane in the EC2 console. For a non–Amazon EC2 instance of MariaDB, Microsoft SQL Server, MySQL, or PostgreSQL, type the host name or public IP address of the database server. For Port, type the port that the cluster or instance uses for connections. For Database name, type the name of the database that you want to use. For Username, type the user name of an account that has permissions to access the target database and also to read (perform a SELECT statement on) any tables in that database that you want to use. (Optional) If you are connecting to anything other than an Amazon Redshift cluster and you don't want a secured connection, uncheck Enable SSL. We strongly recommend leaving this checked, as an unsecured connection can be open to tampering. For more information on how the target instance uses Secure Sockets Layer (SSL) to secure connections, refer to the documentation for that database management system. Amazon QuickSight automatically secures connections to Amazon Redshift clusters by using SSL. You don't need to do anything to enable this. 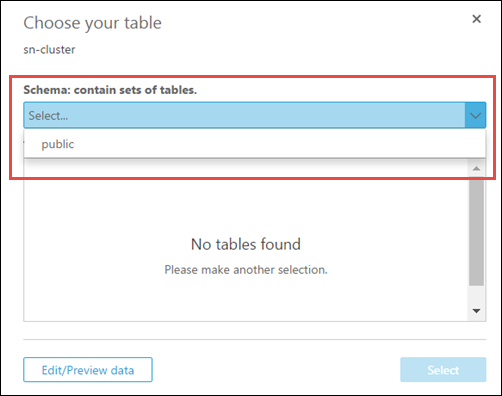 For Schema: contain sets of tables, choose Select and then choose a schema. Note that in some cases where there is only a single schema in the database, that schema will be automatically chosen and the schema selection option won't be displayed. Choose a table and then choose Select. Choose the Import to SPICE for quicker analytics radio button and then create an analysis by choosing Visualize.